The team lookup tab didn’t work for me in OpenOffice 4.1.3, or Excel 2007. It did work in Excel 2013. it looks like some of the features it uses were added in Excel 2013. It seems to work fine if you replace all instances of FullSeriesCollection with SeriesCollection and saving the changes in the debugger. The Extra Discussion forum doesn’t allow attachments (or deletions, generally speaking) due to some logic that I don’t remember but makes sense from when I was informed about it. Was it because of all the spam going on in the Rumor Mill, Chit-Chat, and Extra Discussion? No, it was something to do with the risk of stuff happening with the original paper/picture. This was before the spam influx. A couple things, it appears you are just using the raw elo differences in calculating red win likelihood. that is (red1+red2+red3) - (blue1 + blue2 + blue3). I’m thinking if you’re going to calculate win chance, you want to average out the elo on each side. However, it seems FRC Elo win percentages don’t quite follow chess win percentages based on Elo. I went ahead and generated a cumulative distribution plot based on 2016 match data (and given elo ratings from the spreadsheet). I got what is shown in the plot below. 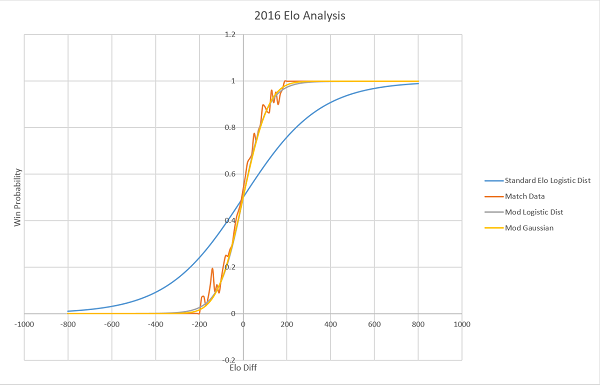 The blue line is the “standard” chess Elo win probability CDF (a logistic distribution CDF), while the orange is from match data. I fit both a logistic CDF (gray) and Gaussian CDF (yellow). The modded Logistic Dist had a mean of 0 and st. dev of 55 while the Gaussian dist had a mean of 0 and st. dev of 93. What does this mean? Well, potentially, difference in Elo rating could potentially be a better predictor of winning FRC matches than chess matches. That is, a small difference in average alliance Elo rating has a larger effect on Win % in FRC (2016) than chess. 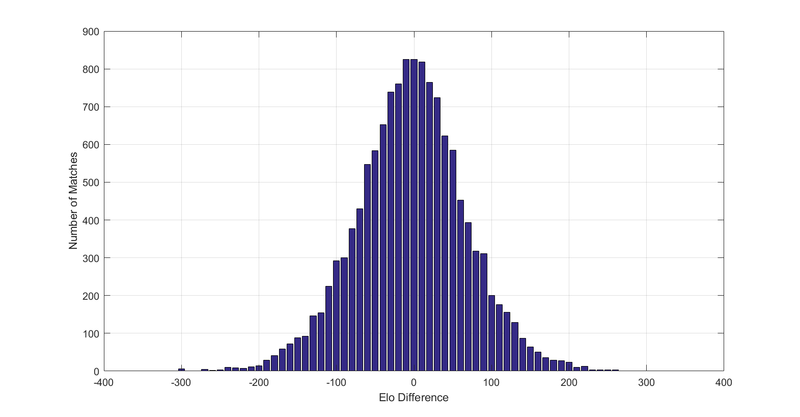 Another thing to consider, however, is the distribution of Elo differences. So it’s potentially a bit less useful than I made it out to be in the previous post because a huge amount of matches have a fairly small Elo difference. Looking at Elo averages instead of sums should be equivalent to changing the x-scale on the cdf by a factor of 3, and that looks like what you have posted. It doesn’t really change anything, because all you are doing is changing the scale. I used the sums in my calculations, which should provide a cdf similar to those found in things like chess. Other methods of combining alliance Elos, such as taking each alliance’s max Elo or doing some kind of weighted average would make a difference. I just haven’t investigated these alternatives. TrueSkill is the natural successor to Elo. It was created at Microsoft for online matchmaking, and as such is able to deal with alliances of players. This is great stuff. I was just introduced to it and I have been using an extended lunch time (the day before kick off) to learn of its intricacies . My first pass has been pretty impressed so far. Also I opened this on a mac using Numbers, as well as OpenOffice on a mac. It seemed fine in both. I don’t have excel on this machine but I would prefer it over the other two options. I look forward to pouring over this with a bigger monitor. I have updated to include 2017 data up through St. Louis Einstein. I’ll post another update after FoC. That was all 2017 matches, quals and playoffs. Total Brier score = 0.2114. Basically the only substantial change is that 1676 went down 20 points and 862 went up 20 points. I have shifted all team Elo ratings up by approximately 70 points relative to my 2017 Elo model. This change in isolation does not actually change any predictions, since only Elo differences are used in predictions, not their absolute values. This does however, both make the ratings easier to interpret as well as make the ratings more comparable to other Elo rating systems. With this change, the long-run average Elo will now be approximately 1500 points, although the average Elo in any season may vary between about 1490 to about 1510. While looking at other Elo rating systems, I noticed that nearly all of them either set 1500 as the long-run average rating (as in 538’s ratings), or set all new entries into the system with a rating of 1500 (as in FIBS ratings). My previous Elo model did neither of these, as the previous rookie starting rating was 1350, and the 2017 average Elo was ~1440. The other advantage to this change is that there is now a (relatively) solid reference point for how good a team is, >1500 = above average, and <1500 = below average. Additionally, I have found that a rating of 1600 is the rating of a 90th (±3%) percentile team in almost every season. One additional reference point for these ratings is that the average Elo rating of rookie teams is 1450. I have extended my Elo ratings back in time to 2005. When I originally built my Elo model, I did not include any years prior to 2008 since some 2007 events contained no match data. After reviewing the years 2005-2007, I have decided to include them in my ratings, although I advise caution when looking at Elo ratings from this period. There are some unfortunate teams that competed in this period but do not have any rating because none of their matches were recorded. 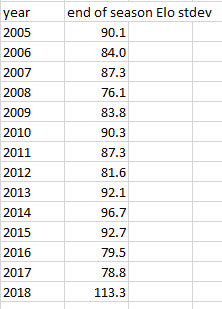 I decided to include these years because, even though the data are incomplete, including 2007 does improve 2008 predictions, and likewise for 2006 and 2005. In the future, it is possible that I may extend the ratings back as far as 2002, but that would require some larger changes to my model since these years had 2v2 matches and not 3v3 matches. I set all team’s starting Elos during the first year of the model (2005) to 1500 instead of the normal starting Elo of 1450. This change stabilizes the average Elo rating for future seasons around 1500. This stabilization actually improves predictive power for all future seasons, although this improvement is not drastic for years other than 2006 and 2007. This is likely because this change makes rookie ratings consistently 50 points below the average, instead of varying depending on the year. This change also allows for more direct comparison of Elos between seasons, although Elos above 1600 will need to be interpreted differently depending on the season, since each season has a different distribution of high-level Elos. In my previous model, I would find each team’s start of season Elo by taking their previous season’s Elo and reverting it 20% toward the mean. I have found though that taking each team’s start of season Elo to be a weighted average of their previous two season’s end of season Elo ratings provides a much better predictor of their next season’s performance. Specifically, in this model, a team’s start of season Elo rating is found by taking 70% of their previous season’s rating plus 30% of their end of season rating from two seasons ago, and then reverting this weighted average by 20% toward the pseudo-mean (1550). This change provides substantial predictive power improvement, particularly at the start of the season. Due to all of the aforementioned changes, some of my model’s other parameters have new optimal values. I have already mentioned that I am now starting rookies with a rating of 1450 instead of 1350 previously, and that the new pseudo-mean will be 1550 instead of 1500. These two changes were mostly due to the shifting up of ratings (change 1), although the other changes may have made a small effect. In addition to these, my new model has lower values for both kQuals and kPlayoffs. kQuals moved from 15 under the previous model to 12 under the current model. This means that team ratings will change 20% more slowly in response to qual match performances. kPlayoffs moved from 5 under the previous model to 3 under the current model. This means that team ratings will change 40% more slowly in response to playoff match performances. I expect that these changes are largely due to the improved start of season Elo ratings. If the start of season Elo ratings are better, it means that the model doesn’t need to respond as quickly to performance at the start of events. In addition to the above 5 changes to the Elo model itself, I have also made a few aesthetic changes to the workbook. Just for fun, I added in the ability to directly compare teams in the “Team Lookup” sheet. To do this, enter a team number into cell B2. To view only a single team, leave cell B2 blank. The second team will show up on the graph with “+” markers. Since the graph can get difficult to see with two teams over 13 years, I have also added a range setting in the “Team Lookup” sheet. Just enter your desired year range into cells B3 and B4 and click “Update Range” after importing your desired teams. I had to work out a few bugs for this macro, and I might not have hit them all, so if you notice anything weird let me know. I have updated the “Instructions and FAQ” sheet to cover much of the information above. I have added an update which includes 2018 data. I also changed the “Team Lookup” sheet to no longer import matches which are missing score data. This should make the graphs nicer for teams like 2590. Thanks to AGPapa for identifying this problem. Amazing Job, I have a question in the “End of Season” Elos there are no team numbers column could you please add it to be able to find teams more easily? I have uploaded a v2 which is scrolled all the way to the left on the “End of Season Elos” sheet to show the team numbers. Let me know if that wasn’t the issue you were experiencing. I also added 2018 to the legend on the graph in the “Team Lookup” sheet. Any thoughts on the increased standard deviation in the last two years? seems like a large jump from the values of the other years (although 2014 is close). I suspect this reflects more on game design than your model, but I’d still be interested in hearing your thoughts. I assume the 70/30 weighting on the past two year’s elo was chosen due to it having the strongest predictions for future performance, do you think that there’s any value in a different weighting scheme for an All-Time elo rank? If so, how might you weight the previous years? Would you keep the current 70/30 system, have an equal average of all years, weight years by the predictive strength of elo? Have you thought of making a GOAT elo-rank and do you think there would be any value to an elo system that didn’t have such a hard reset after each season? These give a loose upper bound on how “dominant” a team can possibly be for each year. 1114 at the end of 2008 had an Elo nearly 200 points higher (or more than two standard deviations higher) than the next highest team, in a year where it was relatively difficult to be dominant. 2018 in contrast was one of the easiest years to be dominant, likely due to the positive feedback loops for scoring described in other threads. It’s because of years like this that I try to make as few assumptions as possible in my Elo model, since my Elo predictions this year were great at the same time as some other predictive methods were poor because they didn’t know how to deal with a game like this. I’m a little concerned that 254 might have been so good this year that some of the assumptions Elo made broke down and under-rated them. I only gave them a 0.012% chance of going undefeated (if you look at pre-match win probabilities), which might have been low, but it’s hard to tell since this is such a rare event, and I might be engaging in hindsight bias. …do you think that there’s any value in a different weighting scheme for an All-Time elo rank? If so, how might you weight the previous years? Would you keep the current 70/30 system, have an equal average of all years, weight years by the predictive strength of elo? I mean, sure, I think there are alternative systems out there that have value, and parameters in my current model could be tweaked to maximize performance in regards to something other than predictive power. I don’t know how I’d weight previous years if building a system like this. I can’t think of any metric to try to optimize like I do with predictive power, so I’d probably just pick values that “feel right” to me, which I am loathe to do since I can’t really objectively justify why I made the decisions I did. Have you thought of making a GOAT elo-rank and do you think there would be any value to an elo system that didn’t have such a hard reset after each season? Yeah, I’ve certainly thought about trying to get more into the GOAT conversation, but I think when you get down to it, these conversations rest more on personal preference than anything objective. You can certainly use statistics to back up your claims, but unless you have a single statistic which encapsulates everything about a team and everyone agrees this is the best metric, people will pick and choose which metrics to use to decide who is the GOAT. Personally, I don’t put much weight in 254’s undefeated season. I don’t think they have many great wins in quals, and they had some awesome playoff partners who provided a lot of help to them when they faced tough opponents in the playoffs. It kind of stinks for them, but it may not have even been possible for them to win the GOAT position in my mind this year just because it was so easy for other teams to also be dominant. All of this is just my opinion though, other people value other things in the GOAT conversation and that’s fine. Sometime I’ll probably extend Elos back to 2002, which would be cool because then we could include the legendary 71 in 2002. All in all, I’m much more interested in maximizing predictive power than almost anything else. Anyone can choose to rank teams however they would like, and that’s totally fine. However, at some point I would encourage people to put their ideas to the test and actually take a shot at predicting things. Otherwise you are very likely getting caught up in hindsight bias. 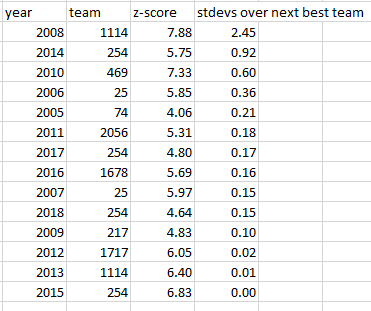 Just for fun, I went and found what kind of scores 254 would have needed to end the season as strong as 1114 did in 2008 relative to the next best team. To do this, 254 would have needed an ending Elo of 2293, which they could have achieved if they had won all of their matches by around 100 more points than they did. Obviously, there are other ways they could have gotten their Elo this high, but this gives a sense of how much better they would have needed to be to get my GOAT title. I love the idea of using standard deviation of ELO to gauge the dominance of proformances accross the years. I don’t like the idea of comparing to the next best team though, because the ability of the second team seems fairly arbitrary and two extremely outlier robots could easily be built in the same year. I think it would be much better to to use the standard deviations above the average to compare across years. I also personally see more recent achievements in a brighter light, (This what you were talking about with persal opinions) because all teams are getting much better at building robots over the years. For example, 1114 was incredibly dominant at the time in 2008, but if FRC gave us the 2008 game again next year, I believe their would be hundreds of similarly capable teams.